The spirit of entrepreneurship might be in Julia Haber’s DNA. 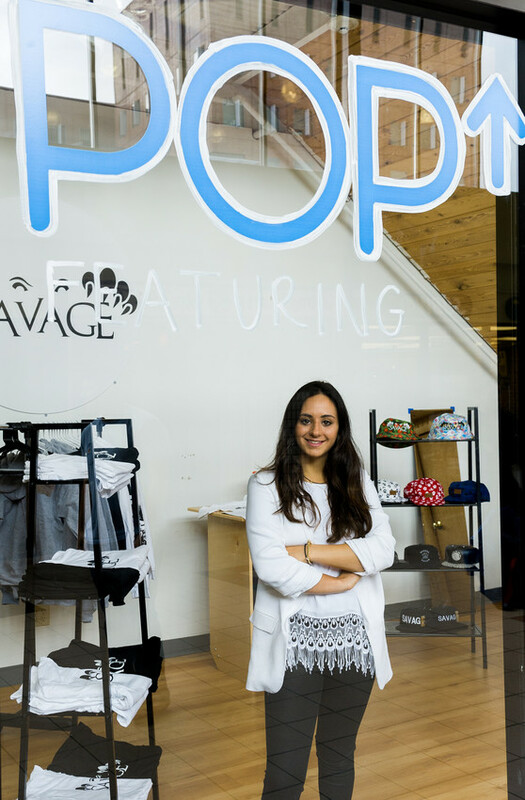 The sophomore launched the POP^ Shop in Marshall Square Mall for student entrepreneurs in the fall of 2015 and the student organization, Vision, for entrepreneurs and those who would like to support the work of startups. During Family Weekend her first year, Haber was in Marshall Square Mall with her parents and began to envision what a then-empty store could be. Her dad helped her bounce around ideas. The result was a pop-up store where student entrepreneurs could sell their products, with backing from a creative and operations standpoint. Haber thought the space could be a real-world experience in a controlled setting in the Syracuse market and within reach of the student body. “It could be something super visual, and an important aspect was cross-campus entrepreneurship. I became involved with many faculty members in the different schools and colleges, which opened my eyes to different aspects of entrepreneurship. It was important to bring all that together,” she says. 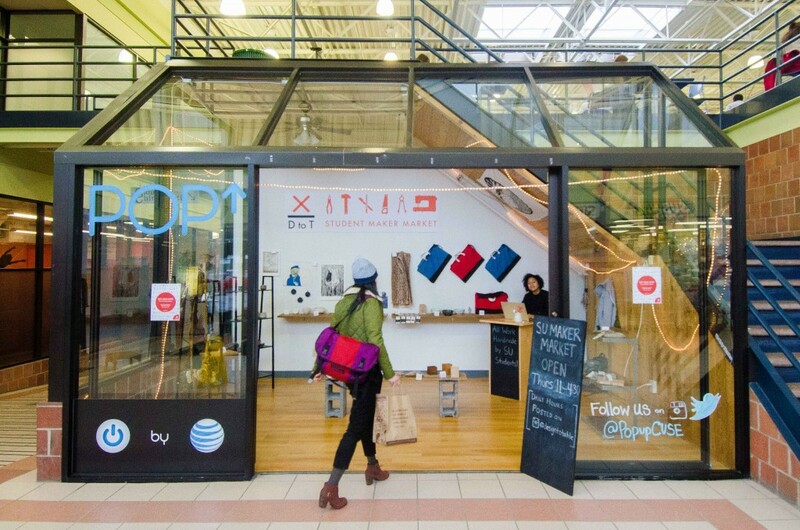 Haber was able to secure funding from AT&T to support various aspects of the POP^ Shop, such as signage. 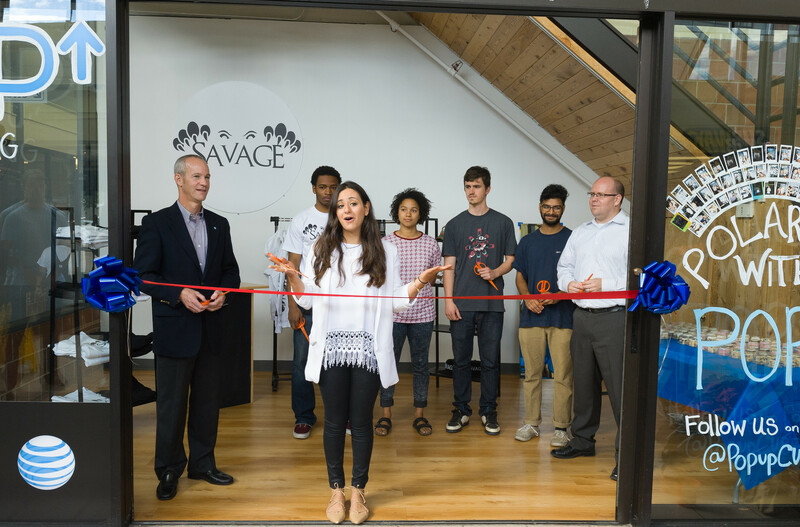 The shop first hosted Steiner Sports and Lululemon and then student entrepreneur businesses Savage, Roux and Design to Table, which pitched their ideas for consideration. “From there, we wanted to solidify this cross-campus experience and have a place to develop their ideas—without necessarily knowing such skills as web coding or marketing,” Haber says. Her student organization, Vision, which she describes as the “ultimate entrepreneurial network,” was approved last semester. “We inventory students’ skills and abilities, and we match them with student entrepreneurs to help them craft a business plan or craft ways to execute their ideas. We encourage people who consider themselves doers and who enjoy bringing things to life,” she says. According to its mission, Vision creates programming and fosters creative ideas to continue the thriving entrepreneurial ecosystem on campus. The group’s advisor is Sean Branagan, director of the Center for Digital Media Entrepreneurship in Newhouse. To spread the word, Haber and Vision’s executive team pitched to classes and had over 150 students sign up. “Vision has an amazing executive board and then we have student representatives for each college who aggregate students to get involved,” Haber says. “It’s almost going to be a graduation process—first they can come to Vision with their idea that they don’t know quite how to execute. Then we help them grow it and the next step would be to pitch the idea to hopefully occupy the shop,” says Haber, who participated in this year’s Spring Break in Silicon Valley immersion program through the School of Information Studies. Haber has learned much about marketing, personal communication and representing a brand throughout the process. Her network of students and faculty has also grown. “I walk around campus and I see people who are motivated and excited—it’s kind of a contagious reaction,” Haber says.